The Rayne Memorial United Methodist Church is a community of faith and love representing, celebrating, and embracing all God’s children as persons of sacred worth regardless of race, gender, ethnicity, national origin, culture, tradition, sexual orientation or gender identity, personal and family history, or station in life. In the full expression of the radically transforming and all-inclusive love of God as revealed through Jesus Christ, all are welcome! Rayne has a diverse and growing congregation with a wide range of musical, spiritual, and educational ministries for children, youth, and adults, as well as ministries for college students, mature singles, and seniors. The Rayne Early Childhood Program is one of the finest pre-schools in the city with an enrollment of over 100 children. 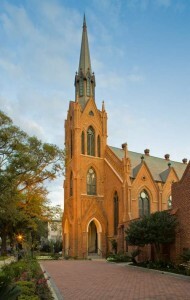 In August of 2005, Hurricane Katrina destroyed the steeple and severely damaged the sanctuary. Since that time, the church has been deeply involved in the recovery and rebuilding of the City of New Orleans housing hundreds of volunteers and working through the United Methodist Committee on Relief. On July 22, 2007, the restored sanctuary was rededicated for worship, and on All Saints’ Sunday 2007 the Aeolian-Skinner organ was heard for the first time in over two years. At Christmas 2007, the front doors opened once again, and on August 24, 2008, the steeple, her beacon and her bell, were rededicated with great joy and gratitude. We invite you to browse our web-site, to contact any member of our staff, and to come for a visit soon. If you would like to know more about the life and work of this community of faith, please call our office at 504-899-3431 or e-mail the church. A member of our staff will be glad to be of assistance. Call us to schedule a tour of the facility or to meet with one of our pastors! Click here to learn about missions you can help with.